A service is an application that runs in the system background and does not have a GUI to interact with. Services provide core operating system features, such as Web serving, event logging, file serving, help and support, printing, cryptography, and error reporting. Not all services are developed by Microsoft. Some applications and drivers install their own services which are developed by 3rd party companies. Security suites are a good example, as they install different services to provide real-time monitoring of your system's activities, firewall protection, etc. These suites need to use the advantages provided by services. One such advantage is that they can be started during the system boot, before other programs and even before you log in. But the most important advantage is that they can monitor everything that runs on your computer while being perfectly integrated in the Windows core. This way, they can provide a very high level of protection. Another example of a non-Microsoft service could be a SSH server; often used in offices for secure remote connections or an auto-updating service for your web browser like the Mozilla Maintenance Service. Knowing what or when a service does something can be useful at times. 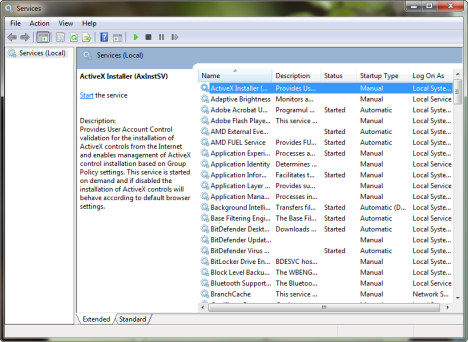 For example, if you know you're not going to need its features you can disable it to speed up your system. If you have a router installed to manage your local network, it's likely that you don't need the Internet Connection Sharing service to run. Or, if you need a service to run, but it's not that important, you can set it to start a little bit later, after Windows, startup programs or other, more important services, have started. There are several ways to get to the services available on your computer. 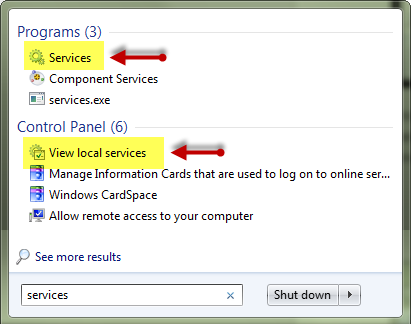 The quick way is to type "services" in the search box from the Start Menu (in Windows 7) and then select either "Services" from Programs or "View local services" from the Control Panel results. Another way is to open a run prompt, by pressing the windows key and "R", then typing in "services.msc". The result you get is a window similar to the one below. There is a nice guide on this subject over at sevenforums already which covers this. For Powershell users, Technet has an article covering this. Some services can be disabled to speed up your system, but only if you don't need them and if disabling them won't cause you problems or inconveniences. You can learn more on this subject by researching more on google or on Microsoft Technet library.